I have been away for so long. I am so sorry. i will be updating at some point in the future. be on the look out for posts from me in the near future. 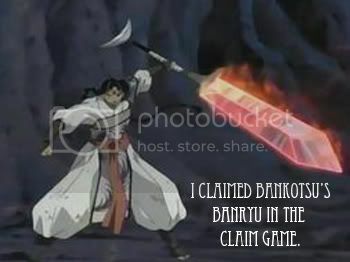 I was the first to claim Banryu. Meh! Millena: Master Tenshi has been rather busy with all of her other fanfictions for other Fandoms she has joined. But that is okay. She loves all fandoms. Kisoka: Master Tenshi is an awesome person and we feel very privilaged to be in her mind. Hi dear! Got your comment, it's okay if you use my fanart on your phone. I thought I'd never see anyone use 'booyaka'. Reminds me of my many days spent playing Final Fantasy 8. I think they reused it in X-2 as well. Feedback from Tenshi Villiers: i love that word. its the best thing that came along in my world before my son. lol.